Fresh from the huge successes of previous tours Peppa Pig’s Party and Peppa Pig’s Treasure Hunt comes Peppa’s brand new show, Peppa Pig’s Big Splash. Opening at the Orchard Theatre in Dartford on 24 October, this touring production will travel throughout the UK and into Ireland until summer 2014. The tour will also include a fourth consecutive Peppa West End Christmas season (details will be announced in due course) and it will be the biggest ever to date. The nursery roof is leaking and Peppa and her friends need to fix it quickly. They set up a fete to raise the money for Mr Bull to do the repairs. There’s plenty of fun to be had as Peppa, George, Mummy and Daddy Pig, as well as Danny Dog, Pedro Pony and Suzy Sheep put up bunting, run stalls and organise a great day out. There's also a Champion Puddle Jumping competition judged by Mr Potato where everyone gets wet and Peppa needs to find her Golden Boots. Another all-singing, all-dancing adventure full of songs, games and muddy puddles is guaranteed for all the family. Peppa Pig returns live on stage with puppets and brilliant sing-a-long songs from BAFTA award-winning composer Mani Svavarsson. Richard Lewis adapts and directs this brand new show, following his previous successes with the first two Peppa Pig stage shows and the the current Ben & Holly’s Little Kingdom tour. Martin Ronan, Executive Producer, said, ‘Fiery Light are delighted to be presenting their third live Peppa show in 2013-2014. Following the huge success of Peppa Pig's Party and Peppa Pig's Treasure Hunt comes the biggest tour yet for Peppa. 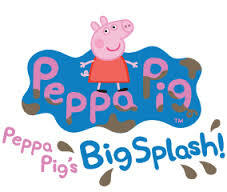 Touring the UK & Ireland for 47 weeks, Peppa Pig's Big Splash will be a fun-packed experience for all Peppa fans. To date Peppa Live has played to almost 650,000 people and as we approach the 10th anniversary of Peppa being a family favourite, we hope the new show will thrill fans up and down the country’. Peppa Pig is forever going to be a classic popular toy for the young ones!